Exquisite antique Japanese Hina Ningyo (dolls) for Hina Matsuri festival, the Girl’s in Japan. The dolls are probably from the late Taisho to early Showa period, 1910 to 1940 and in excellent condition. The level indicates that they were made in Kyoko by Hinagata-ya, pre WWII in Kyoto, size 2 (second largest). The hair of the empress appears to be partially re-haired, original hair (horse?) covered with silk threads. The empress is 21" tall to the tip of the crown and the emperor is 18 1/2" to the tip of the hat. The empress doll is 11 3/4" tall x 16 1/2" wide without the large crown and stand. The emperor is 14" tall x 15 1/2" wide to the tip of the hat. The stands and the fan appear newer than the dolls. The dimensions of the stands are 11 5/8" x 18 1/8" x 4 3/4", including the 2 1/2" thick tatami mattress. Hina Festival takes place every March 3rd in Japan. It is a day of celebration for the well being of every girl in the family. In early days, people were susceptible to natural disasters or diseases, and in order to keep evil spirits away, this day was spent giving offerings to God. This custom was originally adopted from the 7th century, Chinese ceremony that took place on the beach. The Japanese word “Ningyo” (doll) was written on paper, which means, "human" and "shape". The human shaped papers were thrown into the ocean so that the “evil spirits” would be swept away by the ocean currents out of children. 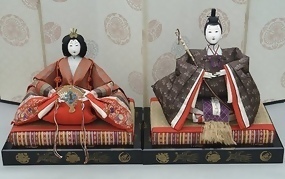 Displaying the emperor and empress dolls during festivals began sometime in the early Edo period (1603 - 1868) while the other dolls (ladies-in-waiting, musicians, guards and servants) were added later. The set of hina dolls was also chosen at the time of marriage among aristocrats, Samurai and Daimyo classes during the Edo period, and was also incorporated in to the bridal trousseau. Generations of hina dolls were often featured with famous families in magazine publications or displayed in museums. It was said that these dolls could supply us with precise history of Edo and Meiji (1868-1912) Hina dolls. They were so well preserved with excellent written records (where and when these dolls were sent out to and for whose wedding or birth) and the names of the doll makers. The Hina dolls were also not exempted from the Tokugawa Shogunate's sumptuary law where the doll sizes became restricted. However, the doll makers compensated by adding greater detail and luxury to the dolls.